The team that made the discovery was led by Olga Cucciati of Istituto Nazionale di Astrofisica (INAF) Bologna, Italy, and project scientist Brian Lemaux in the Department of Physics, College of Letters and Science at the University of California, Davis, and included Lori Lubin, professor of physics at UC Davis. 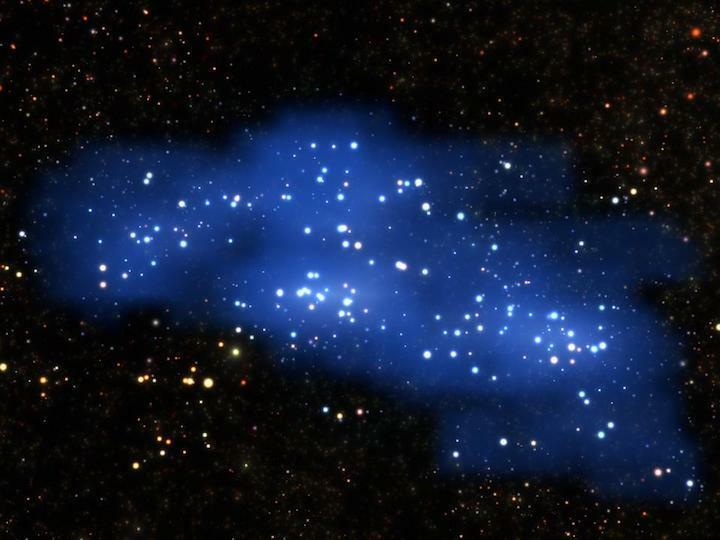 They used the VIMOS instrument on ESO’s Very Large Telescope in Paranal, Chile, to identify a gigantic proto-supercluster of galaxies forming in the early universe, just 2.3 billion years after the Big Bang. Hyperion is the largest and most massive structure to be found so early in the formation of the universe, with a calculated mass more than 1 million billion times that of the sun. This enormous mass is similar to that of the largest structures observed in the universe today, but finding such a massive object in the early universe surprised astronomers. Located in the constellation of Sextans (The Sextant), Hyperion was identified by a novel technique developed at UC Davis to analyze the vast amount of data obtained from the VIMOS Ultra-Deep Survey led by Olivier Le Fèvre from Laboratoire d’Astrophysique de Marseille, Centre National de la Recherche Scientifique and Centre National d’Etudes Spatiales. The VIMOS instrument can measure the distance to hundreds of galaxies at the same time, making it possible to map the position of galaxies within the forming supercluster in three dimensions. The team found that Hyperion has a very complex structure, containing at least seven high-density regions connected by filaments of galaxies, and its size is comparable to superclusters closer to Earth, though it has a very different structure. The researchers are comparing the Hyperion findings with results from the Observations of Redshift Evolution in Large Scale Environments (ORELSE) survey, led by Lubin. The ORELSE survey uses telescopes at the W.M. Keck Observatory in Hawaii to study superclusters closer to Earth. Lubin and Lemaux are also using the Keck observatory to map out Hyperion and similar structures more completely. The contrast between Hyperion and less distant superclusters is most likely due to the fact that nearby superclusters have had billions of years for gravity to gather matter together into denser regions — a process that has been acting for far less time in the much younger Hyperion. Given its size so early in the history of the universe, Hyperion is expected to evolve into something similar to the immense structures in the local universe such as the superclusters making up the Sloan Great Wall or the Virgo Supercluster that contains our own galaxy, the Milky Way. This research will be published in an upcoming issue of the journal Astronomy & Astrophysics. Additional authors on the paper are: G. Zamorani, S. Bardelli, E. Vanzella, E. Zucca and D. Vergani, INAF-OAS Bologna; A. Cimatti and M. Talia, University of Bologna; L. A. M. Tasca V. Le Brun, LAM - Aix Marseille Université; N. P. Hathi and A. Koekemoer, Space Telescope Science Institute, Baltimore; K-G. Lee, Kavli Institute for Physics and Mathematics of the Universe, University of Tokyo & Lawrence Berkeley National Laboratory; P. Cassata, University of Padova; B. Garilli, D. Maccagni and L. P. Cassarà, INAF–IASF Milano; L. Pentericci, INAF–Osservatorio Astronomico di Roma; R. Thomas, European Southern Observatory, Vitacura, Chile; R. Amorin, Kavli Institute for Cosmology & Cavendish Laboratory, University of Cambridge, U.K.; J. Pforr, European Space Research and Technology Center, Noordwijk, The Netherlands; and M. Salvato, Max Planck Institute for Extraterrestial Physics, Munich. The work was supported by the European Research Council, INAF, the U.S. National Science Foundation, the National Aeronautics and Space Administration and the France Berkeley Fund.